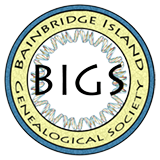 The Bainbridge Island Genealogical Society (BIGS) will meet Friday, February 15, 2019, at the Bainbridge Island Public Library on Bainbridge Island, 1270 Madison Ave, from 10:00a.m. – 12 noon. The topic for the Monthly BIGS Meeting will be “Mapping an Ancestor: Using Geography and Maps in Family Research.” The presenter is Janet O’Conor Camarata, a noted and popular NW genealogist, educator, and technology specialist. Parking is available in the 2 library parking facilities, accessed from High School Ave and Madison Ave North. Free to members, a $5.00 donation is suggested for nonmembers. For more information go to http://www.bigenealogy.org or call 206-755-9283. BIGS is a 501c(3) non-profit organization. This entry was posted in Society News and tagged Bainbridge Island Genealogical Society.